One of the scariest crash scenarios would be getting hit with a full-on body blow to the driver’s side door, and it could be fatal to the driver. It’s why crash tests are conducted, to see how well a car performs in real-life crash situations. 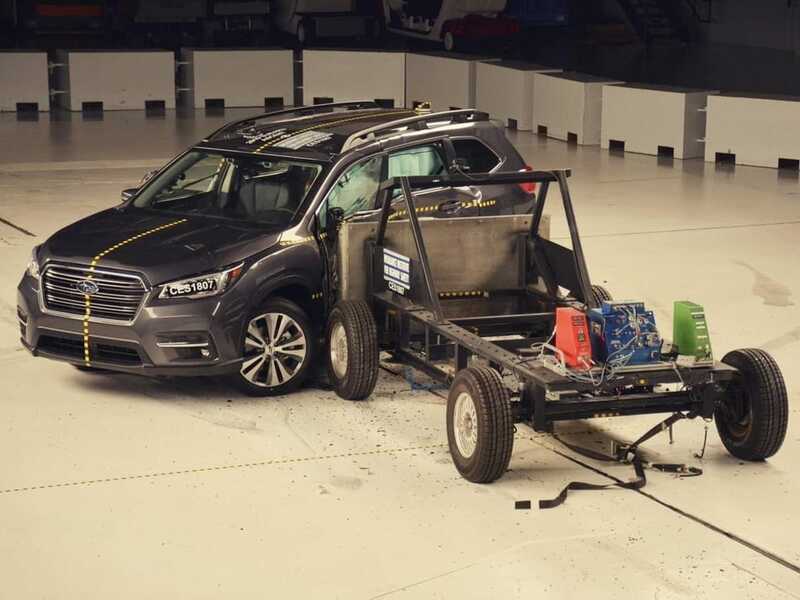 Subaru Canada was able to go to the very first 2019 Subaru Ascent 3-Row crash test conducted by the Insurance Institute for Highway Safety (IIHS). They saw the new Ascent family hauler get hit hard in the IIHS side impact crash test. The results haven’t been released yet, but if Subaru’s impressive track record of top safety picks has anything to do with it, the new Ascent should pass with flying colors. Subaru already has five 2018 TOP SAFETY PICK+ winners with Subaru Impreza compact, Legacy sedan, Outback SUV/Crossover, Crosstrek crossover and Subaru WRX/STI. Subaru also has one 2018 TOP SAFETY PICK winner in the Forester SUV. The new 3-Row Ascent should perform well in crash tests because of three things: The new Subaru Global Platform (SGP), their EyeSight driver assist system, and new Steering Responsive Headlights. The new architecture underpinning the all-new 2019 Ascent first was introduced on the Impreza compact and Crosstrek crossover. The new SGP improves crash energy absorption by 40 percent over present models keeping occupants safer in the event of a crash. Both Impreza and Crosstrek received the highest marks possible from the latest IIHS 2018 tests. The Ascent’s new SGP architecture also integrates the latest version of Subaru’s ring-shaped reinforcement frame, which protects the vehicle's occupants in a collision. It’s been used over two decades on every Subaru vehicles in the lineup. Front-end structural details also help improve safety for pedestrians. The new Ascent will be available with even more safety tech. The family hauler also offers available Blind Spot Detection with Lane Change Assist and Rear Cross Traffic Alert, High Beam Assist, and Reverse Automatic Braking. The all-new 2019 Subaru Ascent is being subjected to the same stringent IIHS safety crash tests as all vehicles in America. Look for the 3-Row family hauler to pass the IIHS crash tests with top honors. Stay tuned. Totally unfair headline it is unprofessional and wrong. You owe the company an apology. I almost didn't read the article because the headline "said it all". Shameful and disappointing. I think caling the author unprofessional and shameful is going a little too far. He clearly didnt think it would be taken that way. After being aware it could be taken the wrong way he changed it. perception is everything. No need to be go calling people unprofessional for what was actually a very well written article. Wow! You really should change the title of the article it is implying the new Subaru Ascent actually did really bad on the iihs safety tests. I read the article mostly because I was shocked they would release a vehicle that did poorly on those tests, especially one that is for larger families. A lot of people aren't going to read the article and will just assume based on the title that Ascent did poorly in iihs ratings. Please change it. Changed just for you! Thanks for reading anyway. Thank you. I apologize if i came across a little rude, I reread my commment just now and thought it could easily be taken that way. Either way i appreciate the change. Keep up the good articles!